I am taking a brief moment to send my deep healing wishes to all those who suffer with illness in their life. I know the pains, the sorrow, the isolation, the fears and the dependency it can create in your world. Having been bed ridden and house bound for many years myself, I recall the loneliness and confusion I often felt. I missed the comings and goings of just every day happenings, like driving or going out sledding with my kids. Using my body in an athletic way was a huge loss for me and I pined to swim in the surf or dance all sweaty hot in a dimly lit music filled bar. I loved cooking and gardening and hiking in the pine clad forests. Working in my busy office, tending to the woes of little ones and their ear infections of the misery of menstrual discomforts among the womenfolk, slipped away as the undiagnosed Lyme disease eroded my world, stripping me of so very much. I am a new person now, as many of you know. Five years of devoted healing work helped me reclaim my life- in a vibrant new vibration. I gained the skill of oil painting as I was recouping. I also wrote an award winning book, on my journey. Now I am out lecturing all over the country on Lyme disease and Inspiration. It is a marvel to even me, that I am swimming a mile in open water with ease daily and yes, dancing in a dimly lit bar this very last weekend! It is a great honor for me meet and connect with so many wonderful souls as I travel with “OUT OF THE WOODS”. You are gifted and wise and sensing beings. I know many of you have been stymied by the medical profession, as you try to recover from the physical woes. Our approach to health in the past 50years became very science oriented and laboratory based. In this process, some of the common sense and traditional methods of Natural Medicine got washed away. Alongside this erosion, the power of our spiritual energy and inner innate skills of will, intention, joy, hope, belief and creativity have been glossed over. These are personal tools and energies we can each harness and use to help ourselves promote a shift in our health and well being. By using positive intention, prayers for healing, willpower statements you can initiate a trickle of the feel good hormones and neurotransmitters in the brain, which will stimulate the immune system. Dancing and laughing in glee last weekend reminded me of what joy and passion we possess within, so accessible via music, art, comedy and beauty. As I interface with many of you, in person, on the web, at a lecture, I am taken with the awareness that our culture has neglected a very essential piece of our beings~the nourishment of the spirit. It is a rare case these days, where leisure, beauty, comforts and joys are nurtured in abundance. We are a hard working society, burdened with dire financial obstacles in most households. Schedules are jam packed and electronics stimulate our sensitive nervous systems nonstop. The hamster wheel spins in a delerium and I want to get OFF!!! I bet you do, too. So, let’s take a break. Let’s turn off the lights, stoke the fire, and put on some great music. Allow your mind to wander, your eyes to drift, your skin to sense. Just hang out. It’s Ok. Actually, it is wonderful. Day dreams, leisurely talks, gazing at the autumn leaves are gestures of self nourishment. Appreciate your senses, the color of the sky, the energy of a moment. You are feeding your spirt when you hang out in this void of space- the act of not doing, but just being. So, beautiful beings, my new friends and acquaintances, readers and maybe just passerby’s, I remind you all, to cherish the pleasure, the bounty, the grace of just simply being you! In the moment of such stillness may you glimpse the treasured gift of this lifetime. As you followers have found, my summer has been chock full of Lyme disease talks, healing workshops, book events and media. Somehow, I’ve managed to keep up with an athletic 15 year old son and seeing clients, though limitedly. I have to say the summer finale on the book tour in Rhode Island was truly spectacular!! What an outpouring of attention, gatherings and momentum I experienced. I am completely impressed with the active Lyme support groups in the region, as well alert concern by people in important roles. Lyme literate practitioners exist in our tiny “ocean state.” Let me share some of the trip. I’ve harbored a fondness for Rhode Island’s soft sandy beaches and warm ocean waters over the past decades, as most of New England has icy, cold water, too brisk to swim in for long. As an avid swimmer I favor their lovely beaches and fell in love with romantic Watch Hill and of course gilded Newport long ago. Their historied charm and stunning waterfronts are just magical. The rest of the state has been mostly a “drive through” experience for me. I’d learned awhile ago, however, that like Long Island, Connecticut, Cape Cod and the outer islands, Rhode Island is Lyme infested and over populated by ticks. Their level of illness has run rampant. A heartfelt thanks to Barbara Smith, Jane Barrows, Irene Weaver and Cynthia Leonard who made my appearances work so flawlessly. Sunday, September 9, Westport Grange, actually in neighboring MA, hosted me with a rousing crowd of 85+. The South Shore Lyme Support Group is holding many lives together, suicidal feelings knocking on too many hearts. This picturesque township, layered with farmland, stone walls, and ocean beach grass is tick nirvana. We had many seriously afflicted attendees. Cable TV taped my two hour presentation and what a wonderful time we shared, as I introduced a powerful healing intention prayer for us all. You are wonderful souls. Island. Barbara Morse Silva, a Lyme literate health editor and weekend anchor was eager to give attention to my Lyme recovery story in “Out of the Woods,” helping us gain more exposure with the epidemic. Though she spent a solid 15 minutes taping with me, the spot of course was a succinct two minutes, But, WJAR and Barbara were gracious and caring. Thank you! 12 noon. Marriott Hotel, Rotary Club luncheon. I was the guest speaker. One hundred fifty rotarians listened attentively to Lyme’s destructive forces. A great audience, and some families with tragically ill members were there. 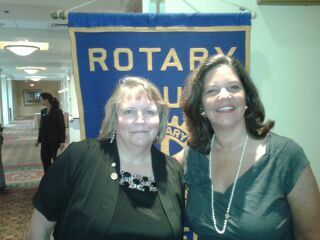 Cynthia Leonard is the go-to gal at Providence Rotary for Lyme info. They host several Lyme awareness events annually. That is terrific! 6 PM. St. Mark’s Catholic Church, Jamestown Rhode Island. Delightful Irene Weaver, seasoned Lyme vet Jane Barrows, and charming Father O’Neil hosted this event. Close to 100 folks came out and guess what…a first for me-I spoke from the pulpit! This was a stunning moment for me to recognize how very far in my healing journey I’d traveled. Seven years ago I was so sick, too weak to stand unassisted, emotionally, physically and spiritually decimated. Death knocked on my door. It was a battle that summer to remain alive. And here I was now, a completely renewed, healed and vibrant being, standing strong and proud, bright and smiling, sharing my hard earned wisdom on the pulpit of a beautiful, grand and welcoming church. My message cannot ring out more clearly~ mending the spirit is just as essential as mending the body. These words washed through me in the brief moments standing by the heavy velvet throne-like chair at the altar. Not a regular church goer by any means, though raised as a Greek Orthodox and Quaker mix (odd I know), as a spiritual being, I know when I am being “summoned!” Thank you God, angelic beings, spirit guides for bringing me far on this journey. I am open, I am listening and always, always I appreciate your guidance. The evening was ripe with emotional Q&A, as so many have suffered for so long. Help is needed here and everywhere, as we know, for better Lyme organism diagnostics, more experienced practitioners and resources. Newport Lyme Support Group leader, Jane Barrows, is loaded with knowledge and contacts. What a fantastic group at St. Mark’s-MD’s, homeopaths, psychotherapists, nurses, herbalists, patients, and caretakers we were. efforts to being guidance and inspiration to your communities. Healing from chronic Lyme is hard work, requires a long time and an integrative medical approach, as well as spiritual recovery. I am blessed by the compassion and openness of our ever expanding Lyme disease community. This is a wondrous opportunity I am living. Up from the ashes, you could say. please listen in here at this link, on Tuesday, September 18, 2012, 11am EDT, with Linda MacKenzie as my host. We will explore lyme diseases as an illness and keys to healing, from the epidemic of our era. I had the great good fortune of being interviewed on NBC TV, WJAR, Providence, RI, by the very savvy and talented Barbara Morse Silva, an Emmy Award winning news anchor and health editor. Please enjoy our time together in the link posted here and of course SHARE with others. Lyme disease needs to be stopped! It is now the #1 fastest spreading infectious illness in the USA, surpassing AIDS and is found in 89 countries of the world. Both Katina Makris and Laura Piazza are living with Lyme Disease and both women have written books on the subjects that cover differing topics. Katina Makris‘ book Out of the Woods: Healing Lyme Disease – Body, Mind & Spirit is her vivid story that offers practical information for diagnosing and treating the bacterial invasion, as well as powerful guidance for mending the broken spirit, mind and physical form. Laura Piazza‘s book (co-written with her mother Gail Piazza) is Recipes for Repair: A Lyme Disease Cookbook was written when she discovered that the food she was used to was not suitable for someone wih Lyme Disease. So she did some research and contacted the author of one of the books she found. She and her mother came up with a cookbook full of recipes both suitable and tasty. Join us and meet both authors! OK Gang! Here is my weekend appearance schedule with “Out of The Woods, Healing Lyme Disease”. Even I am amazed that as an ex-lymie I can handle all this. How exciting! Please pass along and come join me at these wonderful inspirational lyme disease events. A special thanks to Barbara Smith, Jane Barrows, Cynthia Leonard, Jennifer Geronimo for helping coordinate many details! Sunday, Sept 9, 6-8pm, Westport Grange, Westport, MA (cable TV will be broadcasting this). 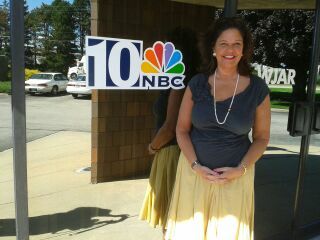 Monday, Sept 10, 10 am, NBC TV ch 10, WJAR, Providence, RI interview with health editor, Emmy award winning Barbara Morse Silva. Monday, Sept 10, noon, Providence Rotary Luncheon, Public welcome! Monday, Sept 10, 6-8 pm, St. Marks Catholic Church, Jamestown, RI.